In this episode, I wrap up our 4 part series on heart rate training. I take what we’ve learned over the past few episodes and apply it to your own unique situation, so you can create your own heart rate training zones. In episode 26, I introduced the series on heart rate training and how it can benefit your running. In episode 27, I shared the background information we need to understand how and why heart rate training works. We also looked at the key metrics that you can use to help measure and set up your training zones. In episode 28, I shared the metrics we need to calculate your resting heart rate, maximum heart rate, and lactate threshold. What to do if Your Friel and MAF Estimations Are Way Off? In the previous episode, I went over how to calculate your maximum heart rate by using the Joel Friel Lactate Threshold Estimation Test and the Phil Maffetone Maximum Aerobic Function (MAF) Test. 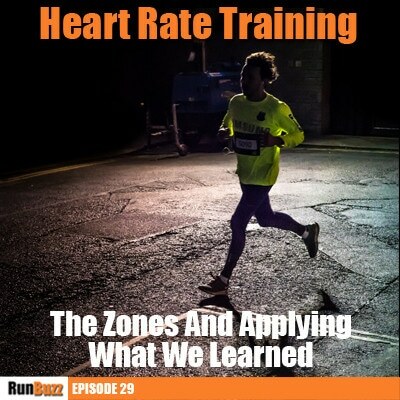 But, before we dig into establishing you heart rate training zones, I want to talk about what we should do if our calculated metrics contradict each other or if you feel like your numbers are off. This can be a common situation, and we had a great thread going in the RunBuzz Facebook group on the topic. A listener, named John, (thank you John), mentioned that he was getting a big variance in results between the Phil Maffetone MAF formula estimation and Joe Friel’s 30 minute lactate threshold estimation. In theory, your lactate threshold and your maximum aerobic threshold numbers should be close. But, in John’s case, his variance between the two was as much as 30 beats per minute. As you can imagine, this lead to questions about what number he should use when setting up his training zones. For John, the MAF formula indicated a much lower heart rate than expected. This result put the approach in question again, since it was so low that it could be hit at very low running speeds or even just by walking! How do we address such a problem? Realize that the MAF method is heavily geared towards the base building phase of training. In the base building phase, we aren’t typically concerned with things like tempo runs, fartleks, or other types of speed work. In base building, we are trying to build endurance. While, the Maffetone approach may give you your maximum aerobic function point, most people who use the MAF estimation are in the base building phase of training and are not 100% fitness optimized. While you may be in great shape, you are still building your endurance. This can affect your results. Calculating heart rate training zones with MAF is easy. You simply take your MAF number and stay below it by 5-10 beats – then you’re good to go. If, however, you go over the MAF number, you’re training anaerobically. For those who want to get more specific about your heart rate training zones, we’ll use Friels’ approach a little later. A common problem with MAF is that many people struggle with staying at that low of a heart rate, one based purely on an estimation – especially beginners. Because it can take a few years to truly maximize your base, your heart rate may go over your MAF more easily than more seasoned runners. But that’s the beauty and curse of this method. If you follow it strictly, you will maximize your base building potential. Plus, in reality, many of us probably should be slowing down. If you find your heart rate is easily going over your MAF number, I would suggest increasing it by 5 beats per minute until you can get to an easy run. You will need to play with this a bit. Again, it’s less about finding that perfectly exact spot with your heart rate than it is about using your heart rate monitor as a tool to keep you in range. This way, your intensity doesn’t creep up higher than needed for your training purposes. You may also find that, as your fitness base gets better, you will be able to keep your heart rate lower, even though you’re running faster. In other words, you’ll adjust to your training methods and get more accurate results to apply to the MAF formula. As mentioned in episode 28, the Friel method uses a 30 minute field test. Now, in my opinion, Friel’s test is harder than the MAF estimation – and it should be. Friel is looking for your lactate threshold. This is where you reach a threshold in which lactate accumulates faster that your body can clear it. If this is the first time you’ve listened to this podcast, or if you did’nt catch the previous episodes, you may want to go back and listen to those first. I go into a lot more detail on what lactate threshold is and why it’s such an important metric. In Friel’s method, zones are calculated as a percentage of the lactate threshold heart rate (LTHR). So Which Method Would I Use? If it were me, I would take both of these metrics, if you can. However, if you’re a newer runner and don’t have the endurance to run at least a full hour, I would start off with the MAF estimation. I myself chose MAF for the same reasons I mentioned earlier: it’s connection to base building. In actuality, I would probably start you off on MAF even if you were training up to a marathon distance if you were still in a base building stage. Now, if you’re able to run marathon or half marathon distances (or, basically, if you have a very solid base for your race distance), then I would recommend starting off with the Friel test. Because it’s extremely beneficial to have a good grasp of where your lactate threshold is, especially if you’re incorporating training runs that involve anaerobic components. But, regardless of what values you initially start with, you should challenge these zones with some real observation and by looking at real data. Don’t take the measurements as gospel straight out of the book. That, is exactly what so many people do and then feel like they aren’t allowed to adjust them. My advice is to apply a series of test runs to challenge and assess your identified training zones. Collect heart rate data along the way and match that up with your feedback on how each run actually felt. Relative to your heart rate data, was the run too easy or too hard? Don’t do this just once but over several runs. If something still seems too easy or too hard, then modify the zones from there. As you get more in shape, you will get faster, even though you’re maintaining the same heart rate. That’s why using the MAF method requires more patience than the Friel test. The results can take some time to generate, but you will improve, and you will do so in the maximum way possible because your intensity will be set correctly in order to facilitate this change. By using a combination of tools – heart rate, effort, testing, and so on – we can dial in your heart rate zones, regardless of whether or not you use the MAF or Friel approach as a starting point.